This entry was posted on Thursday, December 3rd, 2015 at 3:34 pm. For those with a gluten allergy like myself, the holidays can be rough. But there are some great GF recipes out there so you won’t feel like you’re missing out! My BFF made this gluten free pumpkin bread for me last year, (just before finding out she’s allergic too – I must be contagious! ), and it was phenomenal. The best part is that it’s not too difficult – even I was able to recreate it, and I’m not so great in the kitchen. Do not use an electric mixer. Mix all the ingredients by hand. Preheat oven to 350 degrees F, and line 2 large (or 3 small) loaf pans with parchment paper. 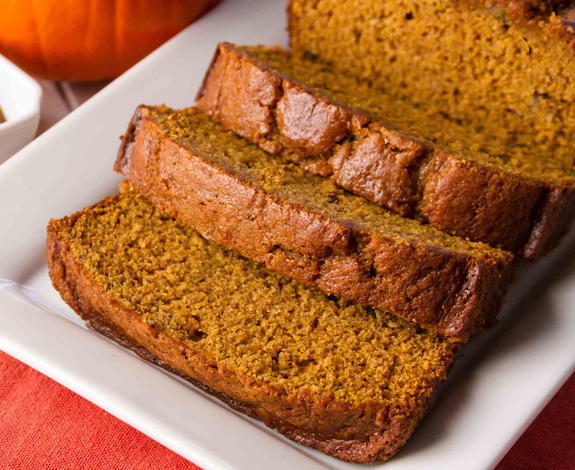 In a large bowl, mix together pumpkin puree, eggs, oil, and sugar until well blended. In a separate bowl, whisk together the flour, baking soda, salt, cinnamon, nutmeg, cloves, and ginger. Alternate stirring the dry ingredients and the water into the pumpkin mixture until just blended. Pour into the prepared pans. Set the timer for 30 minutes and recheck every 10 minutes until done. Loaves are done when toothpick inserted in center comes out clean. Garnish with cool whip if you desire. ENJOY!